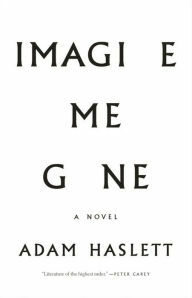 Adam Haslett's new novel, Imagine Me Gone, is not a cheerful book. Far from it. But it is an incredibly well-written, sobering, and insightful look at how mental illness can turn a normal family to a dysfunctional one. But this isn't your run-of-the-mill dysfunctional family story — it's more about the dysfunction itself, and how it affects each family member differently, both in terms of their relationships with each other, and also with others. John, a Brit, and Margaret, an American, meet and fall in love in London in the 1960s. Despite John's warning signs — including a stay in a "facility" — Margaret decides to marry John anyway. She thinks she can change him or cure him or at least help him live with his mental illness, an affliction understood in far less detail then than now. The story unfolds from there, as they have three children, Michael, Celia, and Alec, and move back and forth between a small town in Massachusetts and England. Michael, we soon learn, carries on his father's legacy (when Michael's a kid, there's a bunch of foreshadowing and hints about how Michael and his father are inextricably tied) — afflicted with acute anxiety. Michael is a fascinating character — he loves music, using it as a way to reconnect with the world that he has so much trouble with, and becomes an activist and crusader for black rights and reparations. Michael is something of a tortured genius — the tools are there for success, but he can't seem to arrange them properly to use them to be successful. That's especially true as he grows increasingly dependent on an increasingly huge cocktail of medications. One of the more fascinating themes of the novel is how mental illness skews empathy. Michael is certainly capable of empathy, but not necessarily for the people he should care for. And it's increasingly difficult for his family to understand this. His mother, for instance, who also sees him as her dead husband's proxy, enables him in the wrong ways, paying his bills and encouraging the worst of his bad habits, especially after his periodic unrequited-love-related breakdowns. His siblings, meanwhile (each chapter is told from the point of view of a different character), go about their lives with Michael sort of in the background. But it's clear their father's mental illness has messed with their heads in different ways — Celia is a successful social worker, but doesn't let herself fully trust her long-term partner. Alec, young, gay, and urbane, newly ensconced in New York City as a journalist, moves from hookup to hookup without ever forming any connections at all. I was totally floored by this book, especially Haslett's observation and intuition for describing relationships and motivation for action. Simply put, he gets humans — and is extraordinarily skilled at rendering how we think and feel, and making sentiment relatable and readable. Again, this is definitely an uncomfortable novel, but one well worth reading. My bf struggles with chronic anxiety, and sometimes I wonder if it's better for me to stay away from books like this because I tend to take on the emotions of the books that I'm reading. Like if the book posits anxiety as a destructive force, maybe I will start imagining that my bf's anxiety is worse than it really is, you know?